Are you familiar with Ink & Arrow Fabrics yet? 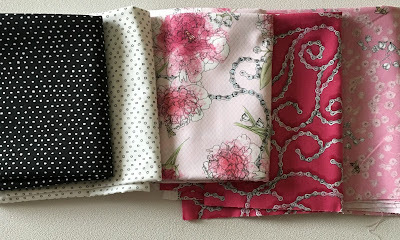 I had a chance to work with a couple of fabrics from their Sweet Rebellion line, thanks to Courtney from Wives of Westwood. Sweet Rebellion is pretty and edgy at the same time. How many times do you see bike chains and peonies combined in the same fabric? I knew exactly what I wanted to do with it. 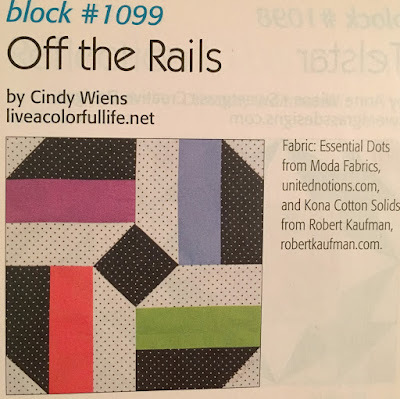 I had designed a block for the the Summer 2015 issue of Quiltmaker's 100 Blocks called "Off the Rails," a variation of the classic rail fence block. While I was really happy with the block, I never made anything more than that one block which I sent to the magazine. 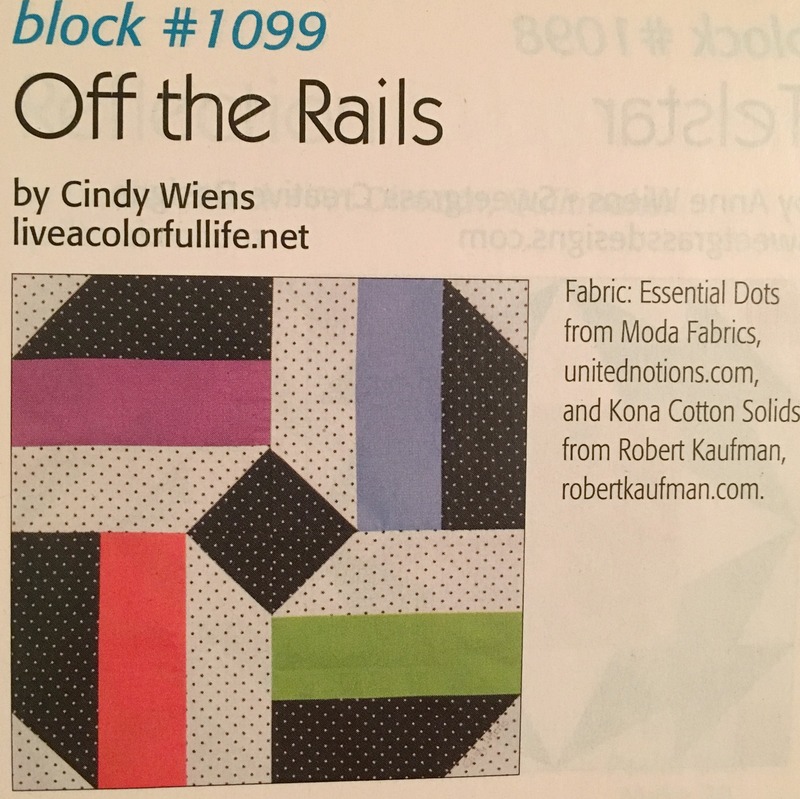 As I have had three blocks published by Quiltmaker's 100 Blocks, one of my goals in 2017 is to actually make a project with each one of them. The beautiful fabric provided the perfect opportunity to start meeting that goal. 4 rectangles 2 1/2" x 6 1/2"
4 squares 2 1/2" x 2 1/2"
This block uses the "stitch and flip" technique. 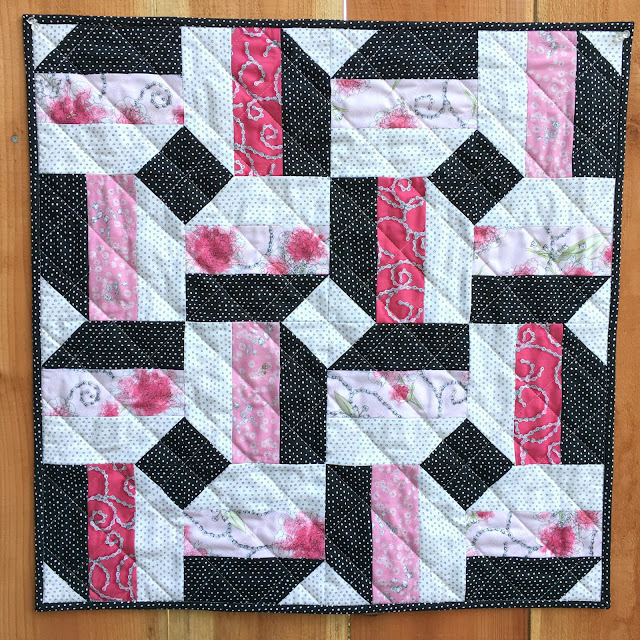 For the black and white dot rectangles, align one of the 2 1/2" x 2 1/2" squares on a corner of the rectangle. Mark a diagonal line from corner to corner as shown. Sew on the marked line. Trim the seam allowance to 1/4" as shown. Flip the patch open and press. Add one of the center rails and sew together. Each block requires four of these units. I really loved the Peonies & Chains in light pink, so for each block I made two units those, one unit with Chain Scroll in Fuchsia and one unit Packed Lily of the Valley in pink.. All four units are constructed like the photo above. Then you just rotate them like this and sew the units together. 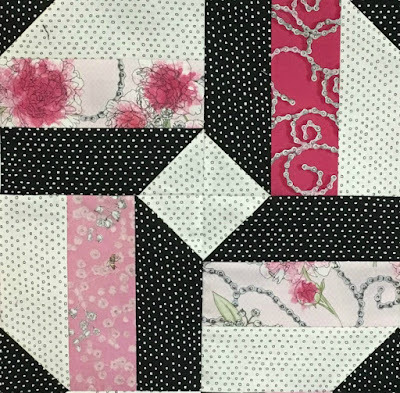 I made four blocks to complete the mini quilt. But since I had never sewn more than one of the blocks, for some reason I hadn't visualized the cool secondary design that popped up in the middle of the block--like a reverse block right there in the center. Here is the completed 24" x 24" mini quilt. I'm so happy with how it turned out that now I want to make a lap-sized quilt using this block. The Sweet Rebellion line has the Square Dot Blender in several other colors as well. And the Chain Scroll comes in a black or white background--SUCH a fun print! Many thanks to Wives of Westwood and Ink & Arrow Fabrics for giving me the opportunity to play with this fun line of fabric. And three cheers--this is my first finish of 2017!! Bringing designs to reality can be so rewarding. Definitely created a secondary pattern and I'll bet in the larger lap quilt even more would appear. The fabric line is very fun.